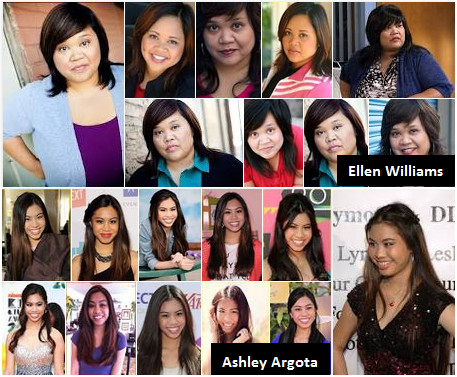 The Two Filipino-Americans actresses namely; Ellen D. William and Ashley Argota are making a name on Hollywood. Williams has been popular on the hit CBS show entitled "How I Met Your Mother" for the past two years already and played a role as Patrice, a cheerful character, that makes the fans love her. On the other hand, Argota will be one of the cast on the second season of ABC Family's "The Fosters" this coming June 2014. Ellen D. William is a graduate of Bachelor's Degree in Theatre Arts from California State University, Long Beach. Born and raised in Santa Monica, California by her Filipina-Chinese mother and her Scottish father. She received an LA Weekly 2009 "Leading Female Performance" nomination for her role as Ruby in "Ruby, Tragically Rotund" according to her bibliography found at imdb. Ashley Argota is a Filipina born on January 9, 1993 in Redlands, California, USA. She is known for her work on Bucket and Skinner's Epic Adventures on year 2011, True Jackson, VP year 2008, and Schooled year 2007. She likes to reading horoscope and she loves butterflies. She was inspired by her mother and says that her mother is amazing and the best person in the entire world. Argota said to appear in the Disney movie "How to Build A Better Boy" Later this year 2014. The recognition of both actresses were featured on ABS-CBN news that catches netizens attention. This only shows that Filipino talents are fit on historic studio - Hollywood. We're looking forward for more actors and actresses to be part on well known entertainment industry.